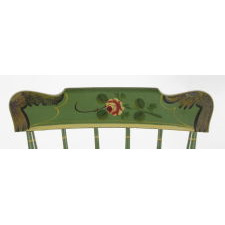 Dimensions (inches): 31.5" tall x 18" wide x 15" deep; Seat height is 13"
Set of 6 paint-decorated, Pennsylvania, plank-seated chairs, in kelly green, decorated with red and white roses on angel wing crest rails. 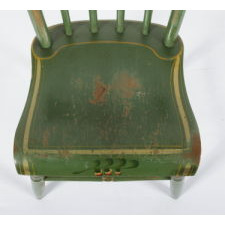 The decoration is beautifully hand-painted to includes green, gold, brown and black detailing on the angel wings and a string of rosebuds on the front edges of the shaped seats. 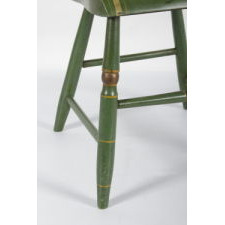 There is both ochre yellow striping and chrome yellow pin striping throughout and gold on the bulbous portions of the turnings. 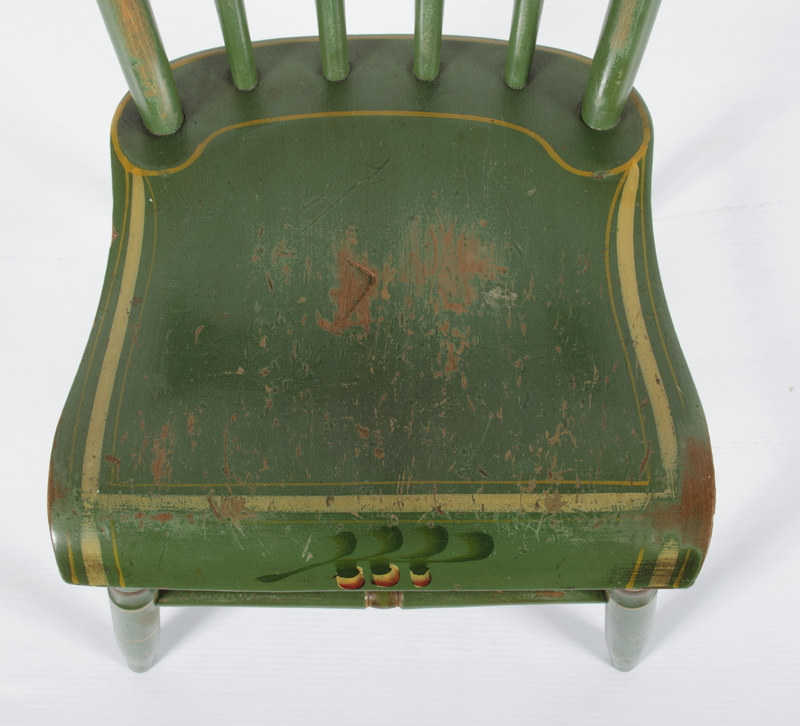 The chairs were made sometime during the mid-19th century, between 1845 and 1870. 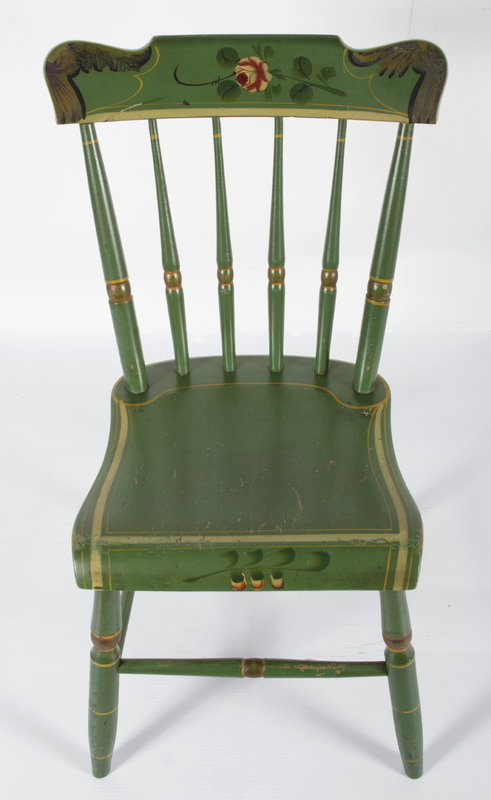 This is a full spindle back design and the origin is South-Central Pennsylvania, perhaps York County. 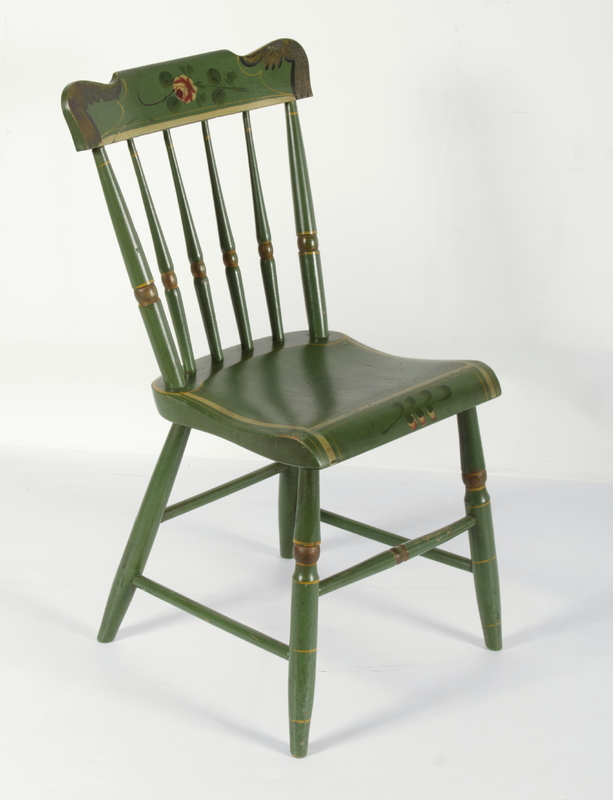 The origin of this chair type in Pennsylvania was a more durable outgrowth of the urban Windsor. 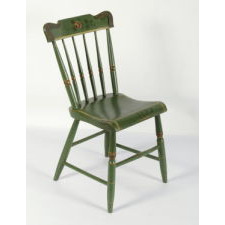 Production began in the 1840’s and had virtually ceased by 1880. 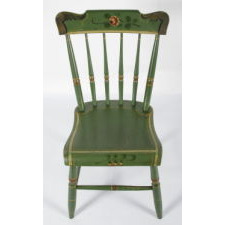 Chairs were typically made by one person and painted by another, although in the same shop. Most historians feel that they were made to order with regard to decoration style, color, and to some degree, construction. 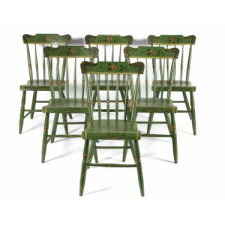 It is almost unheard of, however, to see any more than 6 matching Pennsylvania plank seat chairs. 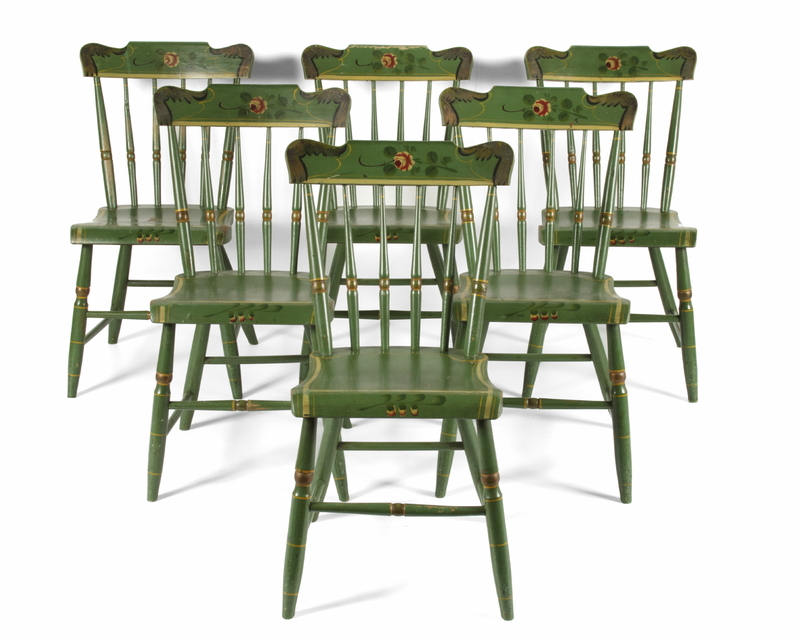 This is a bit hard to explain given the large size of rural families, but the chairs must have been costly enough to make the purchase of more than 6 an extravagant undertaking for most rural households. 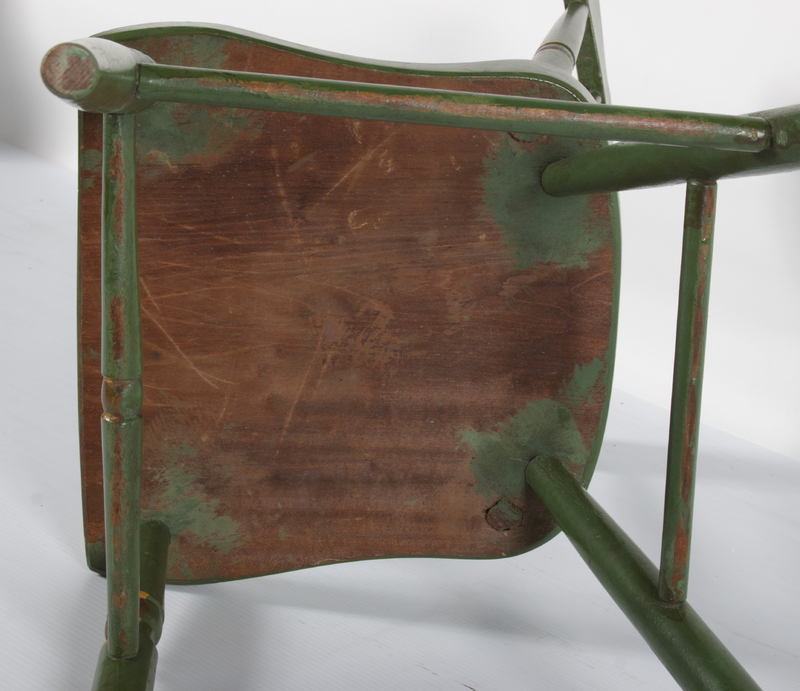 Condition: There is some scratching and paint loss due to expected wear, but the overall condition is very good. The decoration is very nice and intact. 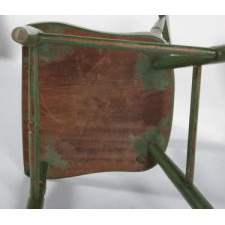 This varies a bit from chair to chair in terms of the striping. 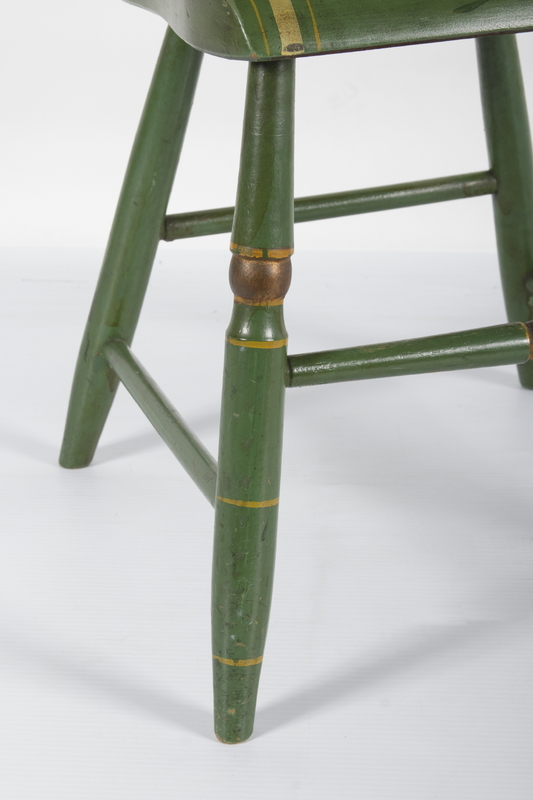 The top edge of one crest rail has more wear than the others. One of the seats has a bit more wear than the rest, but it's not extreme or terribly offensive. 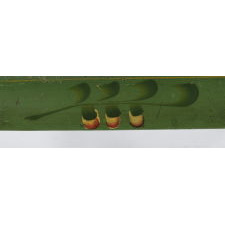 This is pictured in the last image. The paint is untouched.